As you may have sensed from my review of Daredevil #6, I felt pretty much done with this two-part Original Sin tie-in after last issue, and was already mentally moving on to next month’s Daredevil #8. I hadn’t expected Daredevil #7 to pull me back in the way it did, and I definitely hadn’t expected anything so clever, moving and well-crafted. Yes, even while knowing the pitch perfect storytelling this creative team is capable of. At the risk of introducing mild spoilers, I should start by mentioning that portraying Jack Murdock as apparently abusive last issue wasn’t what I objected to. There were definitely some hints that things were not quite as cut and dry as they seemed, and we know Mark Waid knows his way arounds twists and turns. What I hadn’t counted on was just how well he managed to turn it around. 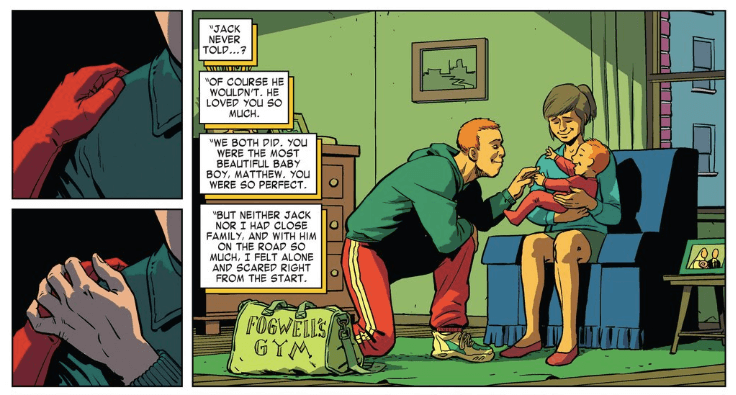 The early teasers for this tie-in suggested that we would examine Maggie’s “sins” (more so than Jack’s), but what Waid does here is pull this particular sin out of it’s usual context of good versus evil – complete with the requisite religious overtones – and instead uses it to say something important about mental health, shame, and stigma. He attempts something daring with one of the most puzzling aspects of Daredevil’s origin and manages to make everyone involved more interesting in the process. Daredevil #7 packs an emotional punch that has important things to say about important issues, without coming across as a public service announcement. Aside from the big pay-off at the end, I also appreciated the overall pacing of this issue, Daredevil’s interactions with the various other characters, and the fact that Daredevil gets to use his brains this time. I love a clever Matt Murdock, and creators recognising the fact that a character like Matt needs to be clever to compensate for not only his lack of sight, but – just as importantly – his lack of a healing factor, impenetrable armour, ability to fly or wield force fields. In this regard, even as Matt spent the entire issue in costume, he most definitely brought along his inner lawyer to Wakanda. Javier Rodríguez provided the pencils and colors on this, his last issue of Daredevil, and he certainly goes out in style. This issue covers a wide range of more or less exotic backdrops, and the emotional content of the story places high demands on any artist’s ability to convey these emotions through the facial expressions, postures and interactions of the characters on the page. Rodríguez does a fantastic job getting all these different nuances to come across on the page. Finally, I was so grateful to get to read this wonderful issue. I was moved by it, and it added so much richness to Daredevil’s already impressive mythos. Thank you Mark Waid and Javier Rodríguez for this issue, and a special thank you to Javier for your tremendous work on Daredevil over the last three years. Good luck with everything you do going forward! I’m surprised there have not been more comments about this issue, as this is the resolution of a nearly 30-year old question/mystery. I was in a position when reading the issue that I was interrupted. This happened just as Sister Maggie revealed her mental condition and before any further context was given. At that point it was not a satisfying resolution, but when I returned and was able to see her story unfold I was dumbfounded. Wade is able to take the traditional themes of Matt’s life like mental health, guilt, and perseverance to show Matt is truly his mother’s son (as much as his fathers’). When the team shows what was really happening in the disjointed flashback from last issue I was truly surprised. The issue was clever and smart … it even had some action. This is just a great comic book/team. I also liked the extremely subtle indications that baby Matt was different and somehow intertwined with a heroic destiny. This was a better issue than last. I’ll give it that. Still not great though, whereas issue #6 I’d rank maybe 4/10 (mostly for the art), this issue I’d give maybe 6/10 (again mostly for the art and Matt outsmarting the “bad guys”). I stand by every criticism I had of the last issue. I keep reading everywhere about this great mystery fans have been questioning about Matt’s mother for 30 years. Even at the end of the issue they state this. I know several other Daredevil fans personally, and have been reading reviews and discussions online for over a decade. I have to say, I’ve never noticed any fans pondering or wishing for some great revelation about Matt’s mom. Most have been like- “Daredevil’s mom? Yeah, she’s a nun Jack knocked up who abandoned them, say… do you think anyone will actually give a real resolution or followup to Milla, or Mr. Fear, or Kingpin, or why Matt Murdock can walk down the street in any city in the US now without being swarmed by lawyers and a SWAT team?” Those kind of questions I see all the time. Not to belittle the actual serious issue of women’s health that this issue dealt with, but Maggie’s revelation came across like some cheesy after-school TV special from the 90s. Maggie was written as a completely different character than her previous appearances in these last two issues just so we could have this PSA shoehorned into the story as justification. These last two issues lessened the Daredevil mythos in my eyes, they certainly added nothing of value to it. It was like the “revelation” in Daredevil Father. I enjoyed this issue very much. I wasn’t clamor ing for a revelation about Matts mother, his mothers reason for leaving was never fully explained throughout the years and I was fine with that. Not sure if the last two issues were a result of the original sin crossover or if this was a plan of Waid’s to include Matts mothers past at some point on his own. That being said I thought it was a well executed issue. I think the issue was dealt with very well and had a reason for being there. It didn’t seemed force to me at all. I would have prefered more detail or maybe more of a character driven arc and avoided the cross continent trek. Maybe the distance traveled was meant as a metaphor to get down to the real heart of the matter. Not a perfect issue, but I think the explanation for Matts mother leaving was well done. In a way I would have prefered that mystery to go unexplained. His mother as a presence, and a spiritual one, had great weight to me. Especially in the Born Again story. Excellent review. And, just fyi, it it got a call-out on the Psychology Today blog. Congrats! I give this whole arc (#6-7) high marks. Maggie’s backstory was pretty much an open book and Waid filled in some of the blanks quite well. As with Foggy’s cancer, Waid takes a serious illness and presents it in a thoughtful, emotional way. That they offered up actual facts and information about this condition in the letters page was terrific as well. While this may not have been the most nagging mystery concerning DD, I think it did broaden his characterization and answered some long-standing questions. Kudos to the whole creative team for their terrific work here. I too thank Mark Waid and Javier Rodriguez for this excellent issue. Respectful to continuity and saying something important without making it a sound like a PSA? To me, 10 out of 10. I’m looking for a website that has a review of the issue Daredevil #7(April 1965) featuring the first appearance of the red devil uniform and featuring the Submariner wanting to sue the surface world for damages. I see from your blog that you’re focusing on the most recent volumes of Daredevil. Do you know of any podcast that has reviewed this 1965 issue? Please advise! This one just came around on Marvel Unlimited and I felt like it was a real tear jerker. I absolutely loved it.